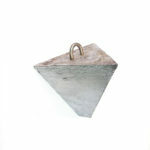 Three sided 35 lb Lead Pyramid Anchor with stainless steel U bolt for use on almost any boat. 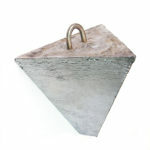 This 35 pound, three sided lead Pyramid Anchor is made with a corrosion resistant stainless steel U bolt. It will last for many years of boating and fishing in both fresh and salt water. If you need a different weight Pyramid Anchor there are 5 others available: 10lb (#DBA-10), 15lb (#DBA-15), 20lb (#DBA-20), 25lb (#DBA-25) and 30lb (#DBA-30). We can also make custom weights. Please give us a call at 360-380-1864 or email info@leelock.com if you have any questions or prefer a custom weight anchor.